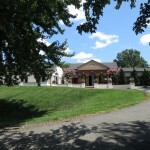 In the southwestern region of Virginia, AmRhein Wine Cellar is nestled in the hills of Bent Mountain. 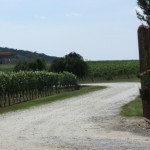 Following a winding mountain road, visitors arrive at a lovely winery with a good choice of red and white wines. Last year, our visit was so enjoyable, we decided to spend our Friday evening there. This year, their event was a Hokie Pokie…Karaoke evening. Though this was our first experience with a Karaoke, we did have a good time. We met and shared the evening with a group of local wine lovers, had wine, food, and listened to those who were brave enough to take the microphone. AmRhein, near Roanoke, is an interesting place to visit. You will find a wine to enjoy and the views are exceptional. 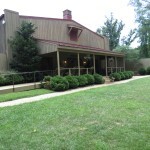 Readers, familiar with my blog or my book, will know that Barboursville Vineyards in Central Virginia is both our favorite winery and one of our favorite places to visit. Every visit has been memorable and our latest one was no exception. 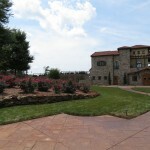 We did a tasting, enjoyed a glass, and toured some of their newest additions to the winery. 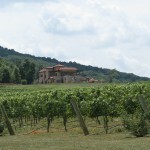 Barboursville wines are some of the finest in Virginia. They are becoming nationally and internationally known. Three of their current vintages, the 2008 Malvaxia Passito, the 2010 Nebbiolo Reserve, and the 2010 Octagon were a part of the Governor’s Cup Case in the 2014 Virginia Governor’s Cup Competition. 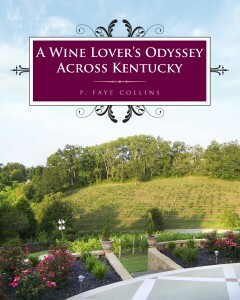 Barboursville wines are featured in wine magazines and win many awards each year. Choosing a favorite wine is difficult because each wine is exceptional and there are seventeen wines on their tasting list. Our favorites are their Sauvignon Blanc, Barbera Reserve, Sangiovese Reserve, Cabernet Sauvignon, Cabernet Franc Reserve, and their Nebbiolo Reserve. While available for sale only, their Octagon and their Petit Verdot Reserve are both amazing. The winery has grown immensely since our first visit over twenty years ago. On our first visit there was a small, cozy tasting room; today the tasting room can accommodate large groups but still retains the same welcoming environment. The latest addition is a special tasting room available for tastings of their library wines, those wines that are not typically on their tasting menu. It is lovely and we look forward to visiting on a weekend when it is open sometime. 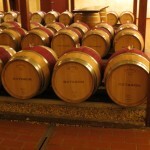 We also visited the Octagon room where the barrels holding that special wine are aging. If you’re ever in Central Virginia, I recommend a visit. The gorgeous vineyard, the historic grounds, the beautiful tasting room are all worth the visit and the excellent wines will keep you returning. 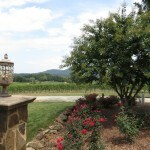 Central Virginia, home to many of the state’s finest wineries, is the site of Keswick Vineyards. 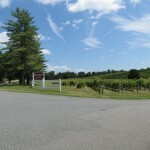 There are 43 acres of grapes on the 400 acre Edgewood Estate. 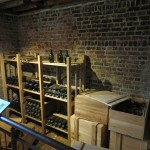 Currently visitors can taste seven of their wines. Of those wines, three make use of the Norton grape. They produce a light Norton Rosé and a wine named Royale, made in a manner similar to ice wine. While the flavors of both were exceptional, their residual sugars were a bit too high for our palates. Their 2012 Norton Reserve was excellent. With a violet aroma, and a deep, dark color that is found in most Nortons, the flavors are smoother and more refined than some of Nortons that I’ve tasted due to a special yeast used by their South African winemaker. 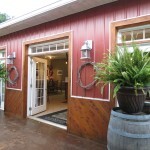 Keswick Vineyards is one of the most beautiful wineries in Virginia with a lovely inviting tasting room. 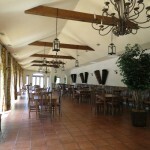 The grounds have tables available for visitors to sit and enjoy the views and the fine wine. 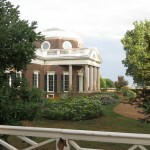 Thomas Jefferson’s home, Monticello, is one of our favorite places to visit. The atmosphere and ambiance, from the moment you leave the shuttle bus that takes you up the mountain, ignites a feeling of going back in time. 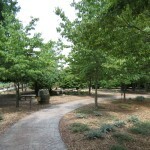 Visitors walk the same grounds that Jefferson did when he lived there. The Thomas Jefferson Foundation, the owners of 2500 acres of the original plantation strive to hold true to Jefferson’s memory with all restorations. They do an excellent job. We, of course, have visited Monticello many times, but each visit is unique. 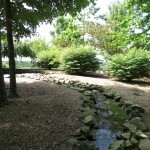 It seems like each time you get to experience something new, or learn something new about the home or the grounds. This trip was not different. Our tour was one of their special evening tours that takes visitors on a behind the scenes look at the house. We visited the public rooms and then moved on to the second and third floors. On those floors, restorations are being done to allow a glimpse into the lives and bedrooms of those who lived there. 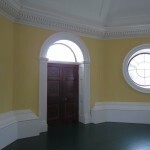 A visit to the dome room is enjoyable as the views from the windows are breathtaking. Our guide, Jim Pippen, was knowledgeable and helpful in answering all questions. After the tour, we were treated to the opportunity to have a glass of wine from the vineyards of Gabrielle Rausse, the vitaculturalist at Monticello. His vineyard is just a few miles from Monticello. During the time we spent on the grounds we were lucky to chat with both Jim Pippen and Marianne Cole, another guide. 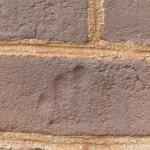 Marianne showed us something we had never seen before on the outside of the house — marks on the brick made by finger prints of a child when the bricks were being made and a bullet hole from a bullet fired during the Revolutionary War. Monticello is an amazing place to visit. 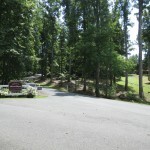 If ever you find yourself in central Virginia, or if you are looking for an interesting place to vacation, I recommend a visit. You will be impressed. 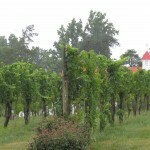 Just down the road from Thomas Jefferson’s Monticello, a vineyard was planted in 1774 by Filipo Mazzei. 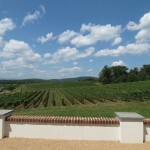 Jefferson’s dream was to produce a quality Virginia wine. 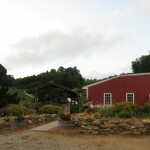 On that same site today, Jefferson Vineyards, a family farm winery, produces 6000 to 8000 cases of wine annually. 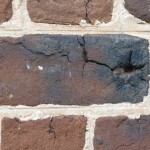 Virginia’s wine industry today more than fulfilled Jefferson’s dreams. Virginia wines are respected and recognized as some of the best made in the United States, winning awards at many competitions and often being recognized in national magazines. 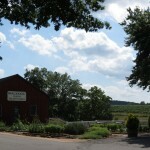 Any wine lover will find something to love at Jefferson Vineyards. Ben, our host for the tasting, was knowledgeable and friendly. 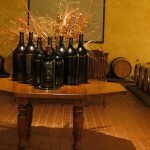 Their offerings are mostly dry, but have enough residual sugars to appeal to even those who prefer sweet wines. Pinot Gris, Rosé, Chardonnay, and Viognier are their white offerings and each one was pleasing to taste, even though those are not my personal choices of white wines. They offered exceptional dry reds. The Cabernet Franc was excellent and had a tasting surprise; there was a big of Lemberger in the blend. The Petit Verdot was also enjoyable with hints of espresso and blackberry. Their Meritage, a red blend, was especially tasty with a blending of Petit Verdot, Merlot, Cabernet Franc, and Cabernet Sauvignon. 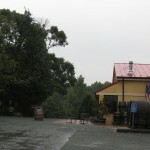 We enjoyed our visit, even though it began with a dash through the rain to get to the tasting room. 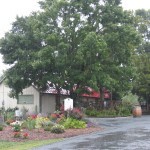 After all, if it’s raining, a winery is a nice place to wait it out.